Across the Young Harris College campus, new life is beginning to stir. The sun is shining and students are beginning to shed their winter layers and head outdoors. The new warmth in the air is hinting at the end of cold temperatures and everyone is looking forward to the summer months to come. Before we can skip to summer, however, there is one much-anticipated activity that must take place: spring break 2011. The website also reveals that these ancient people enjoyed a good party, too, saying that they celebrated with days of drinking and dancing, probably not unlike today’s spring break parties. Our modern-day idea of Spring Break, however, began in 1936 when the swim coach at Colgate University in Hamilton, New York brought his swim team to Fort Lauderdale to practice. The trip was successful and became a tradition for the school and for college swimmers in general. Gradually the popularity of travelling to Fort Lauderdale in late winter grew among college students with approximately 20,000 visiting in 1954. For years Fort Lauderdale was the “official” spring break headquarters, but in the 1980s it lost its title to Daytona Beach. Daytona was the main Spring Break destination in the early 1990s, but students were also beginning to explore others areas as their spring getaway, such as Panama City, which hosted over a half-million spring breakers in 1997 alone. Along with different Florida cities gaining popularity for this mid-semester vacation, many people began traveling abroad, exploring areas such as Cancun, Mexico, the Bahamas and Jamaica. In more recent years, ski trips and mission trips have also become popular things to do on break. Just like today, YHC students from years past felt the stress of school and looked forward to this much needed break as well. The assistant editor of the Enotah Echoes in 1984 wrote about the necessity of spring break in her column. She says that her fellow students were feeling run down, emotions were high and everyone was in need of a break from academic life—something that today’s YHC students can definitely relate to. She continued by saying that many students would spend their break at the beach with friends, while others would go home to hang out with their family members. A similar article written in April of 1992 tells what that year’s YHC students did for their spring break. As can be expected, several mentioned the beach and quality time with family, while others say that they worked. One student even travelled to Norway over her spring break. Clint Hobbs, vice president for Enrollment Management and YHC class of ‘88, says that spring break was a blast when he was a student. It took place in April instead of March and oftentimes fraternities and sororities coordinated their trips so that they went to the same location. Just like today, popular places for students were Panama City and Myrtle Beach. Whether you decide to head to the beach, go on a mission trip, or just relax at home, it is safe to say that everyone at YHC is ready for this much-needed break. When someone mentions Thanksgiving, images of turkey, football and spending time with family come to mind. For many Young Harris College students the annual Thanksgiving Dinner held in the Grace Rollins Dining Hall comes to mind. This well-known tradition took place this past Wednesday and consisted of two shifts- one at 4:45 p.m. and another at 5:45 p.m. Approximately 442 students were served by 23 faculty members. 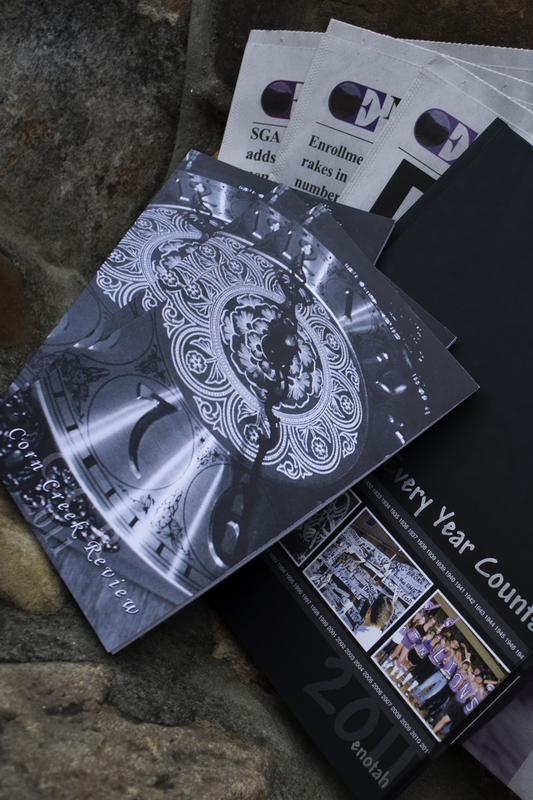 While the event is held annually at YHC, many do not realize the deep roots that this tradition has in YHC’s history. The dinner involves getting dressed up, going to the dining hall where we are seated with friends and being served family-style by professors and other faculty. Austin Freeman, a junior theatre major from Hartwell, says that his favorite part of the Thanksgiving Dinner is hanging out with good friends. While Dr. Sean McGreevey, director of residence life, said that he loves to serve the YHC students at Thanksgiving. What many do not know is that years ago every meal at YHC used to be served this way. While Thanksgiving dinner did exist in 1946, it is difficult to determine when the tradition began. Some claim it began when Dr. Charles Clegg was president in the 1950s and early 1960s. While others say it started in the 1970s. Regardless of when it became an official YHC custom, the meal is enjoyed by students and staff, and this year’s dinner was no exception. 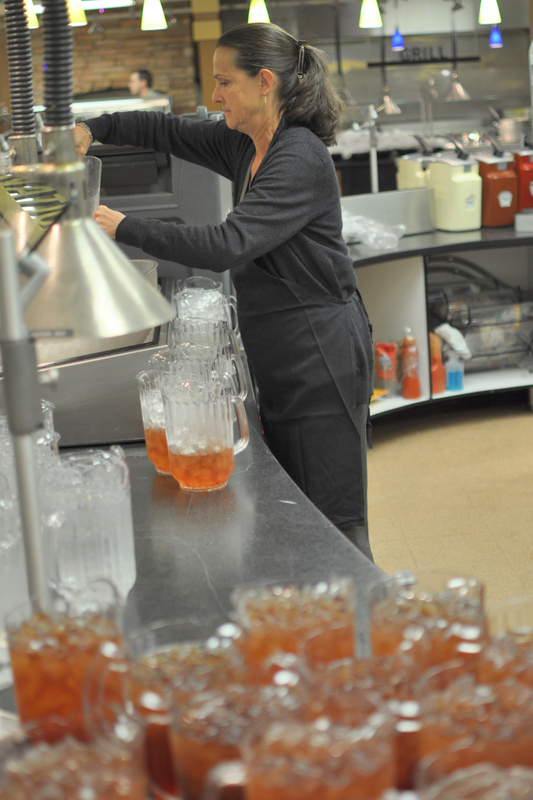 Allen Clark, general manager of the Grace Rollins Dining Hall, said the dinner went very smoothly. “There was plenty of food and plenty of people to come eat it. It looked like everybody was enjoying themselves. I enjoyed it,” Clark said. 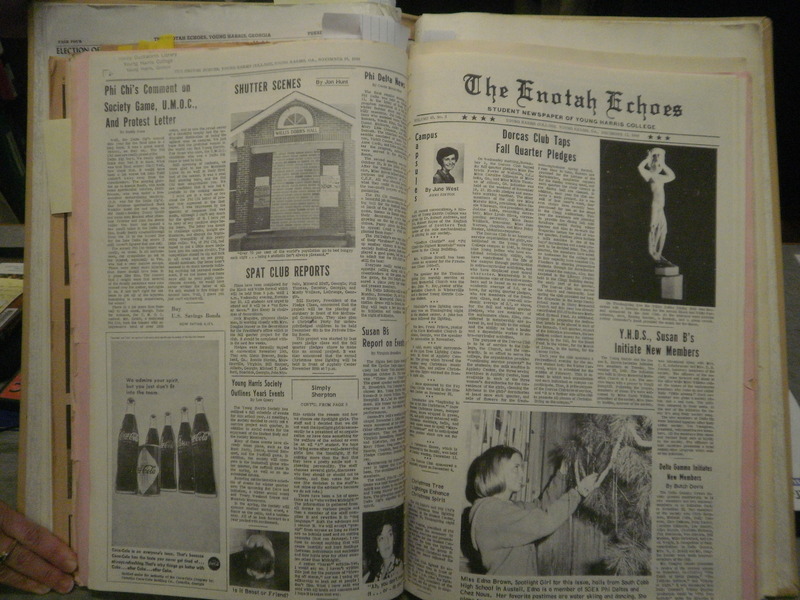 The Enotah Echoes newspaper accepts advertisements from on campus organizations and from businesses. We sell online advertisements and print advertisements. The prices of our ads are based on size and color quality. YOUNG HARRIS—On Saturday, the Young Harris College men’s soccer team posted their second victory of the season against Erskine College. This win is the Mountain Lions’ second win of the week and give the team its first win streak of the season. Junior midfielder Trevor Monroe led the game in scoring with two goals, while freshman Niall McCabe scored one goal to put the game away late for the Mountain Lions. This performance by the team resulted in a 3-1 victory for YHC to give them a record of 2-4-4 on the season. The Mountain Lions opened the scoring in the 15th minute as Monroe fired a shot underneath Erskine goalkeeper Robert de la Vina. Monroe’s score gave Young Harris an early 1-0 lead. The score remained 1-0 until the 58th minute when Monroe again found the back of the net off of an assist by sophomore defender Thomas Crosby to give the Mountain Lions a 2-0 advantage. In the 62nd minute, Erskine’s Jonathan Rutter picked up his second yellow card of the match and was sent out, giving YHC the man advantage. But it was the Flying Fleet of Erskine College that took control of the momentum in the game by getting a goal in the 63rd minute by Brady Johnson with an assist by Matt Sluga. Erskine had a chance to tie the game in the 68th minute when Lucian Johnson was whistled for a foul in the penalty arena. The penalty shot by Jack Kimber was unsuccessful though, as the Mountain Lions held on to a 2-1 lead. McCabe sealed the victory for YHC in the 82nd minute off of a half-volley shot into the back of the net which gave the Mountain Lions a 3-1 advantage. Wezley Barnard recorded seven saves for YHC, while de la Vina had three for Erskine (6-5). YHC held a slim 15-13 margin in shots and for the first time all season, the Mountain Lions failed to have a corner kick as Erskine dominated that category, 11-0. The game featured 28 total fouls and nine total yellow cards. 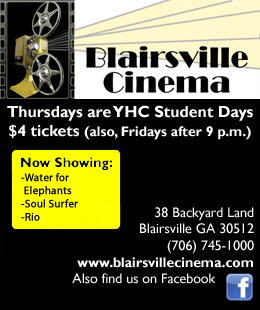 Young Harris returns to action 5:00 p.m., Friday, Oct. 15 at the YHC Soccer Field against Thomas University.